Go Girl! is packed with positive energy, encouraging girls everywhere to be proud, thankful, and happy! Get inspired with a 6 page color lesson, 8 colored example pages, and 30 black and white coloring pages with several journal-style fill-in pages. Below are some example pages from the book. Welcome to my HAPPY & COLORFUL world of NOTEBOOK DOODLES! Inside this book, you'll find 30 of my fun and inspirational notebook doodle designs that are just waiting to be filled with color! I've also included more than 20 color palettes to help get you started on your coloring adventure. 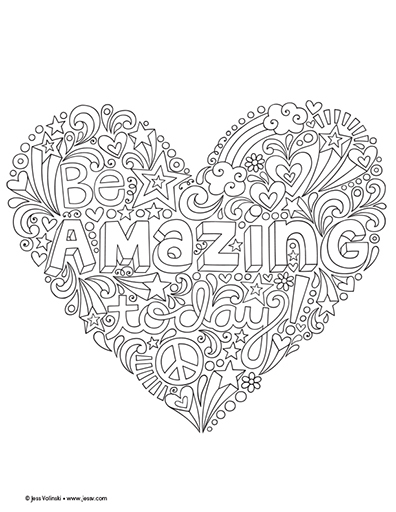 Not only is coloring fun and relaxing, it's also a creative opportunity to BE YOURSELF by expressing how you feel through color. Whatever art materials you love to use—watercolors, colored pencils, markers, crayons, gel pens--they will look stunning on this high-quality, extra-thick paper. Each page is perforated so when you're done, it can easily be removed to hang up or give as a gift. Because the best part of creativity is sharing it!